As soon Donald Trump entered the race 2016, it became clear that the usually anti-GOP network news would accelerate their bias when it came to Donald Trump. After all, he is a Washington outsider who doesn’t follow the long established rules for a candidate and president, and he has a disregard for the politically correct nonsense of the day. 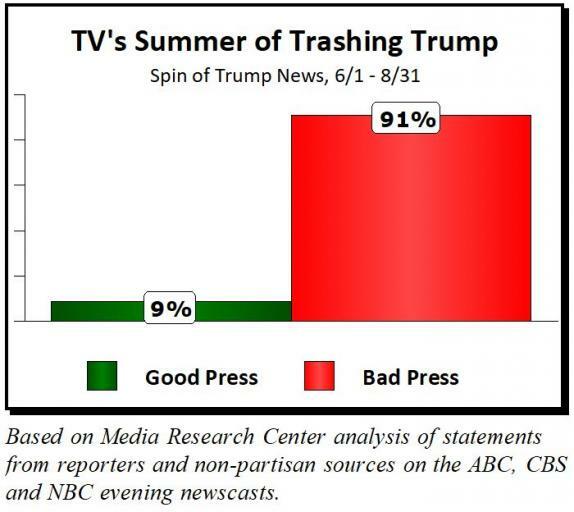 The MRC which has been tracking the anti-Trump bias has released new data proving the network news teams were acting as expected. Before and since he was elected Trump has duked it out with reporters, outlets, and spin-doctors alike, with instantaneous lightning bolts of reality being fired directly from his massively powerful Twitter account. In return, the mainstream media turned up the heat exponentially, lambasting the Commander in Chief in new and reprehensible ways. To put it lightly, it was an onslaught. Trump was suddenly endowed with a thousand new, insulating characteristics as the media miscreants lashed out in vengeance. The President was now a bigot, a racist, a tax cheat, a Kremlin operative, and a man who enjoys sexual depravity. Now through the power of analytics, we can quantify just how terribly one-sided all of this presidential coverage has been, and the numbers are astounding. 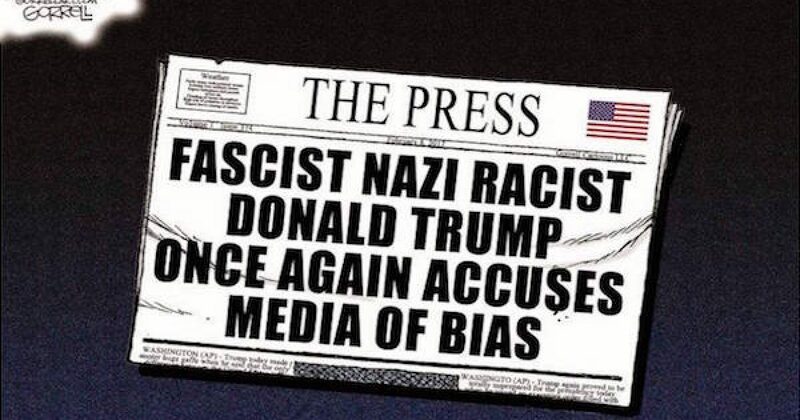 “Since Inauguration Day (January 20), Media Research Center analysts have reviewed every mention of President Trump and top administration officials on ABC’s World News Tonight, the CBS Evening News and NBC Nightly News, including weekends. As of August 31, coverage of the administration has totaled nearly 74 hours (4,418 minutes) of airtime, or about 39 percent of all evening news coverage. “For comparison purposes, coverage of the Obama administration in all of 2015 and 2016 totaled 59 hours (3,544 minutes), or roughly 10 percent of the available broadcast airtime. In other words, Trump has already received more coverage in his first 224 days in office than Obama received in his final two years as President. That wouldn’t be bad if the coverage was balanced, but it hasn’t been. Since inauguration day the coverage of President Trump has been increasingly negative. During the first three months of the Trump administration, the MRC calculated that the coverage was 89% negative. During the summer months June-Aug. the negativity increased to 91%. Much of that summer coverage was the Russian collusion story (415 minutes-94% negative) which still hasn’t turned up any evidence. Just imagine how much better off this country would be if the networks covered Fast & Furious, the IRS scandal, Benghazi or any of the other Obama scandals that much. But of course, they couldn’t because those scandals were real and the person behind them was a Democrat. Journalism and reporting used to be a noble profession. To many of us, it still is. Sadly, however, those who spew out what the networks call news make those who believe in truth and fairness look bad.